Metabasalt rock with quartz courtesy of Specialty Granules. Near Blue Ridge Summit, Monterey Pass, and bordering a portion of Robert E. Lee's Gettysburg retreat route is the Charmain plant of Specialty Granules LLC. The site of the green metabasalt quarry and mining operation was opened by the Hayman family in 1923, and was also known as Funkhauser's for awhile. 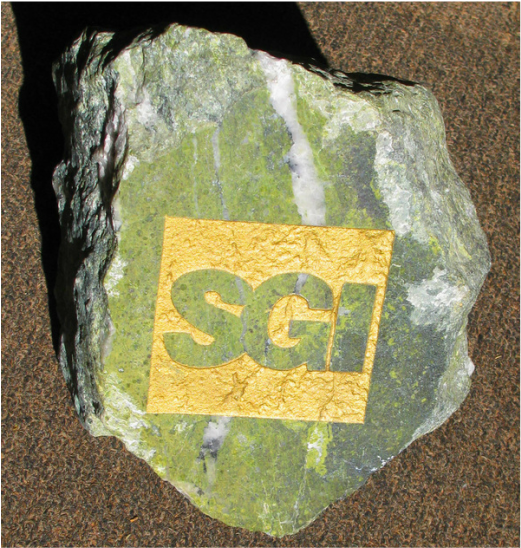 SGI has since those times provided high-quality specialized products to the North American building materials industry for over 90 years. Interestingly, 98% of the plant's business is in mineral granules for the asphalt roofing shingle industry. The green stone is mined in open pits, then crushed and sized, and some of the granules are coated with a semi-ceramic coating to produce a rainbow of colors for roof tops. Refined "dust" for tennis court manufacturers, and aggregates for road building and paving are other important parts of SGI's business. From its modest beginnings in the 1920s, Specialty Granules has grown to become the local employer of over 150 "miners" -- some second and third generation employees dedicated to a safe environment. New Enterprise Stone & Lime Co. began operating the former Valley Quarries' Bullfrog Road location in 2015. Originally, the limestone quarry was opened about 1860 by John Gellbach of Fairfield. An advertisement from 1917 described the operation as the "Gelbach Lime Quarries".